People who read Books about old explorations in the Western Himalayas and Karakoram and the Hindu Kush come across a term quite often “Muztagh”. The first time I read this name, and though I was unaware of the meaning I knew it was a strong word. For a long time Muztagh was the name given to the almost impenetrable wall of Mountains which separate Kashmir from Central Asia. An of course with everything in Central Asia the word has Turkic origins. Muztagh is made up of two words : Muz/ Buz which means Ice and Tagh/Dagh which means Mountain. So it means Ice Mountain which is similar to the word Himalayas which gets its from Sanskrit words Him meaning Snow and Alaya which means home. To the Ancients in India any Mountain which was permanently Snow covered was a Himalaya and in the same way the word Muztagh was the term used by the Turkic people to describe any Mountain that was permanently covered with Snow. Simple implication is that Snow covered Mountains always had a certain degree of reverential awe attached to them and it is no wonder that in may beliefs the Mountains were supposed to be the place the Gods resided. 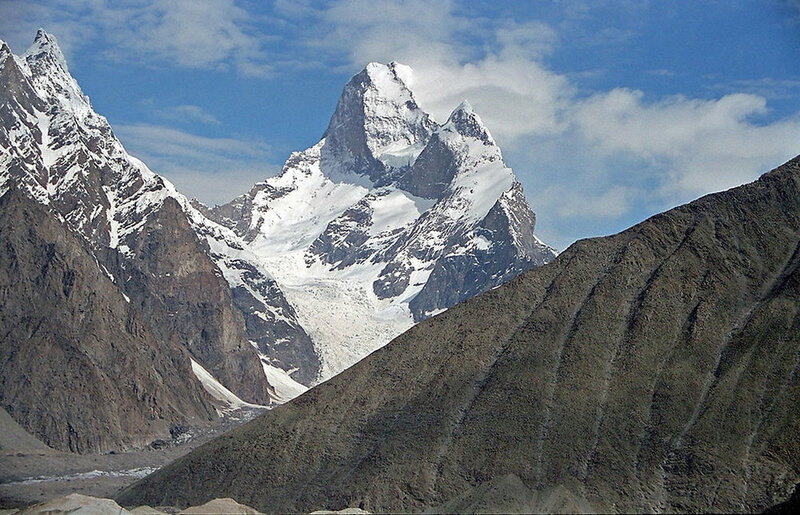 The Karakoram was for the longest time referred to as Muztagh. The Karakorams because of their perpendicularity are the most impenetrable Mountain Ranges in the World and the people never went into them and there is simply no inhabitation. That's why it took Westerners to actually figure out that K2 was the second highest Mountain in the World. To the locals (as in the people living closest to the K2) it was simply a Muztagh out of many Muztaghs. And to them any Mountain in any direction was simply a Muztagh. They didn't really care if it was the Karakorams, the Himalayas, the Hindu Kush or the Pamirs. And this is unlike say in Nepal where the Everest was known as the Sagarmatha or “The Goddess of the Sky’ and the Tibetans called it the Chomolungma or the Holy Mother. And as of today the term Muztagh is still in use for some Mighty Peaks in the Karakorams, in the Pamirs and even on the Northern edge of the Tibetan Plateau near Mongolia. And it was also the name of a very famous Pass which connected Baltistan with Central Asia made famous by Francis Younghusband who came down from Central Asia into Baltistan via the Mustagh Pass. Infact Younghusband identified two Passes as the Muztagh pass. One was the Old Muztagh Pass and the other was the New Muztagh Pass. Both Passes were well over 5000 m and were on the watershed between the Tarim Basin to the North and the Indus Basin to the South. The Muztagh Pass was the shortest Route between Skardu and Yarkand and by extension the shortest Route between Kashmir / Punjab bypassing Ladakh and into Central Asia and was a part of the Silk Route in those days. The Pass had gradually been abandoned as it became treacherous to cross due to Glacial movements. And now coming to the Mighty mountains that carry the Muztagh name. The mightiest is of them all and one of my favourite Mountains is the Muztagh Ata. Not only is it a “Muztagh” but its an “Ata”. Ata is the Turkic word for Father/ Ancestor. So Muztagh Ata means the Ice Mountain Father. 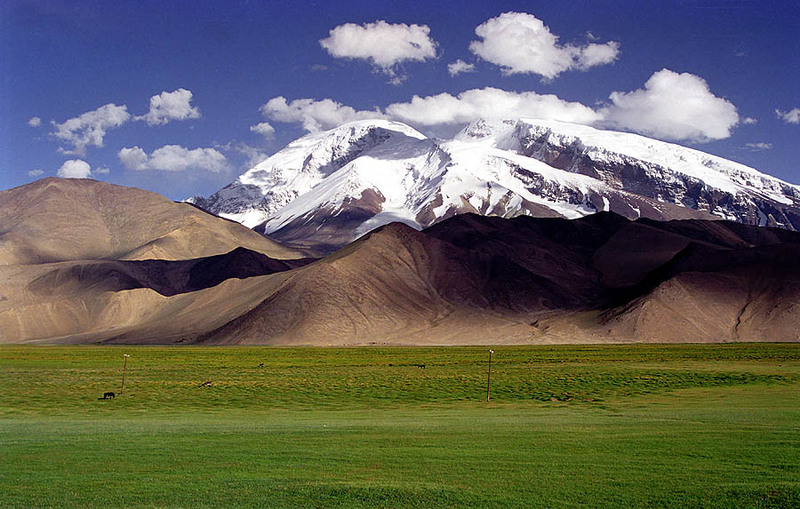 At 7509 m it is one of the highest Peaks in Central Asia and though regarded as a part of the Kun Lun Range by some it is considered a part of the “Eastern Pamirs” by most. Whatever Range its classified in it is a majestic Mountain and said to be one of the few 7000+ m Peaks which is considered easier to climb than most other Peaks of that classification. And as per one scholar the Rig Veda also mentions a Mountain called Mujavant from where the best Soma came from and he is certain that the Mountain in question is none other than the Muztagh Ata. Interesting to say the least. Now we come to another interesting Mountain called the Muztagh Tower which is in the Baltoro Range of the Karakorams. This Tower shaped Mountain was first immortalized on film by none other than Vittoria Sella who took a picture of this impressive Peak. At 7276 m it just great justice to its status as a Muztagh. Infact the pic of the Muztagh Tower was used in some Book where it was titled simply as the “Last Citadel” and it is almost one. The “Last Citadel” was climbed in 1956 when Sella’s pic set off a race between two separate teams of Mountaineers. And the most isolated Muztagh. The “Great” Muztagh or the Ulugh Muztagh. The word Ulugh in Turkic stands for “Great”. This is an extremely remote Group of Mountains at the North of the Tibetan Plateau and its lies on the Northern front of the Kun Lun Mountains. For a long time the elevation of this Mountain was said to be 7700m plus but in 1985 using modern equipment the height was measured to be 6973 m but didnt do anything to take from the Ulugh part. It still is unclimbed and it is said that many Expeditions have even failed to reach the base of the Mountain due to its remoteness and due to the fact that driving to the Mountain involves going through terrain of between 4000 m to 5000 m. And it is a beautiful Mountain. Doing great justice to the Muztagh part as well. And leaving you with a pic of the Sasser Muztagh (also known as Saser Kangri as Kangri is the Tibetan word for a Mountain) as seen from the Khardung La. At 7672 m it does great justice to its title as a Muztagh. And once you are done with with your selfies at the superlative sign boards at the top take a look North. And when you spot the Saser Muztagh just bow down. A little. You just saw a Muztagh.